The Samsung Galaxy Note 4 has been released for a couple of months now and the secondhand market is now filled many used Note 3s. However, not all of them are originals. Be careful, especially when buying these products via Craigslist – where you have no return policy whatsoever. This is from my personal experience, when I bought a Note 3 on eBay. I’ll also include some tips on how to get your money back – if you receive a fake one. If the latter is your case – scroll to the bottom! Many people who have seen this video have left comments, stating that both phones are real. THEY ARE NOT. Special Thank you to T-Mobile. To be honest, looking at the product you will not be able to notice anything fake about it. The packaging looks real, the charger, the earphones, the manual, the phone, cover, case, etc. First giveaway is the pen. Most fakes do not include the S-Pen, it only includes a stylus! This is tricky because air command will be installed on the fake phone and it will launch when you remove the fake S-Pen! When you turn on your phone, you will be greeted with Samsung. However, turn it off and on again, you’ll be greeted with Android. You’ll also notice the craftsmanship of the phone. Quite flimsy, you can press on the screen and see discoloration. The camera isn’t up to par. It isn’t as fast as it should be. 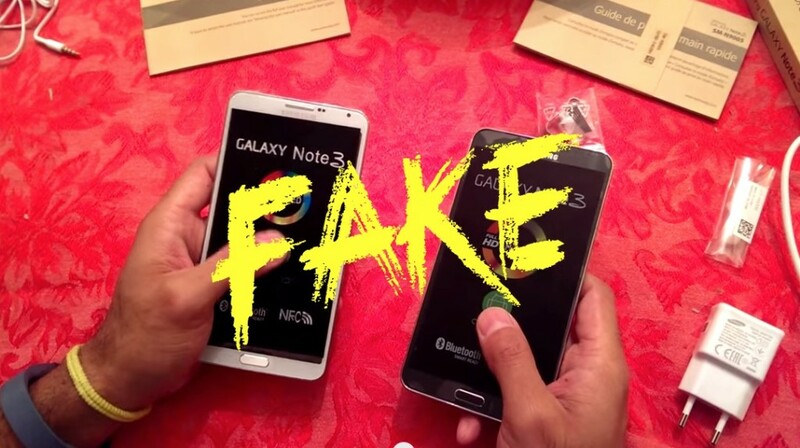 Next is to check the specs, most fake Note 3 does not come close to the real thing in terms of specs. This fake one had 1GB RAM (vs. 3GB), 12GB of storage (vs. 32GB), processor is dual core, and not to mention a terrible camera. There are apps out there from the app store, such as, Device Info Wallpaper, to easily check your specs. TIPS: if you’re going to buy in person, ask if you can see the specs of the phone. You should also meet by Starbucks or somewhere with WiFi, in case you want to double (triple) check by downloading an app. What to do when you receive a FAKE phone? If you bought a fake one from Craigslist, the best thing you can do is file a police report. You can try tracking your seller down through other posts, but the chances of them giving your money back isn’t likely. If you received it from eBay. You have two options. First, contact the seller, most of them will give you your money back immediately, and you just mail the phone back. The next option is to report it as a fake phone. 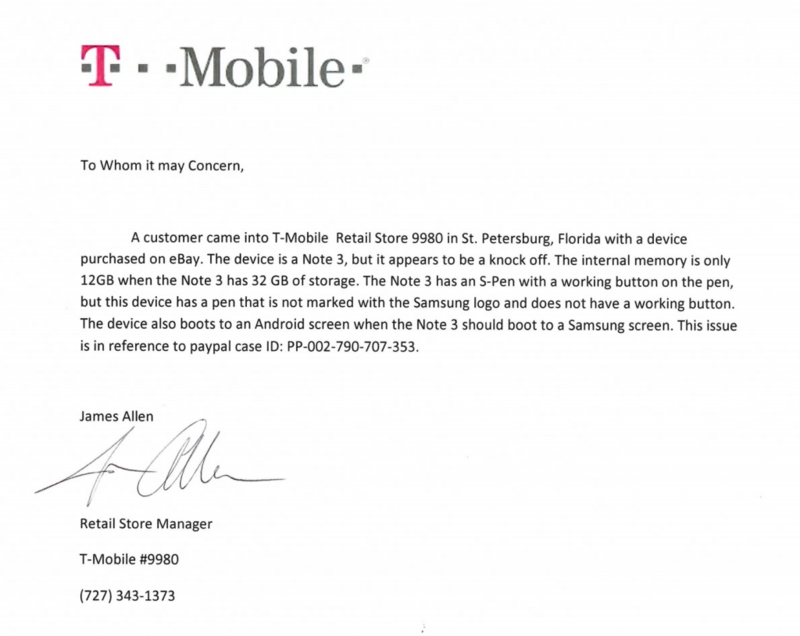 NOTE: if you report this as a fake – it is up to you to prove it is a fake via a 3rd party letter (in my case T-Mobile) on official letter head, stating that is it a fake and referencing your Paypal case ID. This might be more work, but instead of returning the phone for someone else to buy, you destroy the phone. This is how I destroyed the fake one. Obtaining the letter can be difficult as most companies aren’t obligated to do it, since you didn’t buy it from them! T-Mobile (my service provider) was friendly enough to write the letter and it’s probably one of the main reasons I’ve been with them for so long. Also, online chat with Samsung will not work. YouTube video will not work. Only a 3rd party letter, on official letter head, with the company information, stating that it is a fake along with your Paypal ID. Has this happened to you? Any advice or tips?